While starting her life as a Grand Banks 54 SX, Chaos has been significantly rebuilt, adhering to the design modification prepared byC. Raymond Hunt Assoc, by both Lyman Morse Boat Builders and Front Street Ship Yard. With added water length, completely new engine room with new engines and equipment, and the addition of a fly-bridge, this yacht still has a family resemblance to the Eastbay 54 SX, but that is where the similarities end. Chaos has enjoyed the ownership of knowledgeable yacht owners that have had the desire and means to transform an already well established yacht into a magnificent long distance express cruiser. With an exceptional inventory list and a proven history of maintenance by two of the best boat yards in North America, Chaos offers a great opportunity to own semi custom yacht, in Bristol condition at a great value. United Yacht Sales New Jersey would love to guide you through a personal showing of this 57' Custom C. Raymond Hunt Assoc. 57 2003. 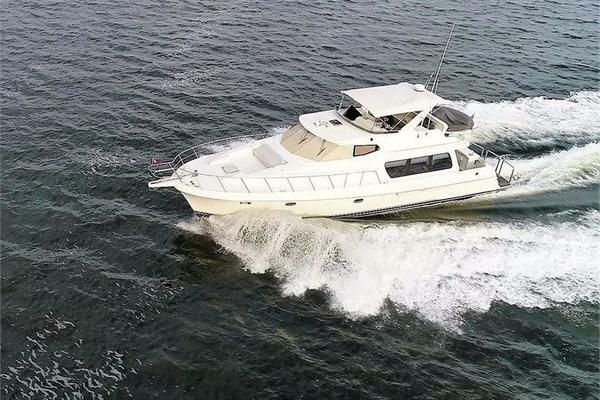 This yacht for sale is located in Belfast, Maine and priced at $1,290,000. For a showing please contact us by filling out the form on this page and we will get back to you shortly! Custom C. Raymond Hunt Assoc. Solid fiberglass hull with foam coring above the waterline. During the major rebuild period, three feet were added to the hull with a custom five-foot swim platform above. This was done following extensive design and engineering work provided by C. Raymond Hunt and Associates. The entire hull was faired, epoxy barrier coating applied and topsides were finished with new custom Awlgrip color to a mirror finish. Rigging kit Includes:U-1 series AGM battery with box, smallfuel/water separator, aluminum prop, doel fin. A Certified Professional Yacht Broker (CPYB) is recognized as having achieved the highest level of industry accreditation, available only to fully-qualified yacht sales professionals. 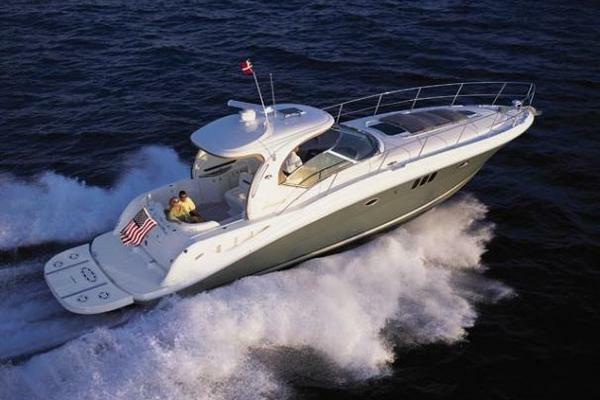 The CPYB program is administered by Yacht Brokers Association of America in partnership with Florida Yacht Brokers Association, Northwest Yacht Brokers Association, California Yacht Brokers Association, Boating Ontario Dealers, British Columbia Yacht Brokers Association and Gulf Coast Yacht Brokers Association. The CPYB program is also endorsed by the Marine Retailers Association of the Americas (MRAA) Marine Industry Certified Dealership (MICD) program and leading yacht manufacturers as a key component of their own industry standards; the highest level of achievement for their member yacht sales professionals.Experience & Validity The CPYB designation is earned by eligible yacht sales professionals, who, after serving a minimum of three years as a full-time professional, have successfully completed a comprehensive written examination to validate professional competency.Continuing Education A CPYB is committed to their personal and professional development through continuing education, as mandated for CPYB recertification every three years.Ethics & Standards A CPYB adheres to, and is accountable to, a nationally recognized Code of Business Ethics and conducts yacht sales transactions in accordance with a stringent set of industry standards of practice.Fiduciary Responsibility A CPYB maintains a dedicated escrow/trust account to protect their client’s funds. A CPYB understands their fiduciary responsibility and obligations with respect to client funds.Transaction Management A CPYB uses proven, industry-recognized transaction documents, which fully and clearly describe all terms and conditions of a transaction. Honesty & Integrity A CPYB maintains the highest standards of professionalism, acting with honesty and integrity.Trust & Confidence A CPYB instills confidence, trust and consistency in all transactions involving fellow yacht sales professionals for the benefit of the client.